A good sample autobiography can take several forms. It can be a recording, put on video or written. The most common example of an autobiography is still the written form. 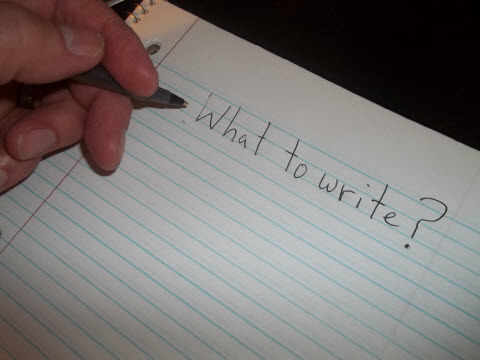 And when writing an autobiography, you have two primary choices. 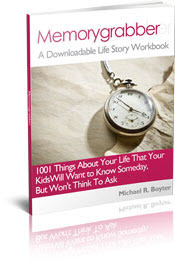 basically a book (workbook) with questions, prompts and other activities to help you go back into your memory bank and pull out memorable moments that you've, perhaps, long forgotten about! Me personally... I love the fill-in-the-blank option. Put a blank sheet of paper in front of the average person, then tell them to write down some of the stories of their life, and they will begin to freak out! They do this because they believe they don't write that well and/or they can't think of much to write about....so they give up before they even get started! This is why an autobiography templates help tremendously. 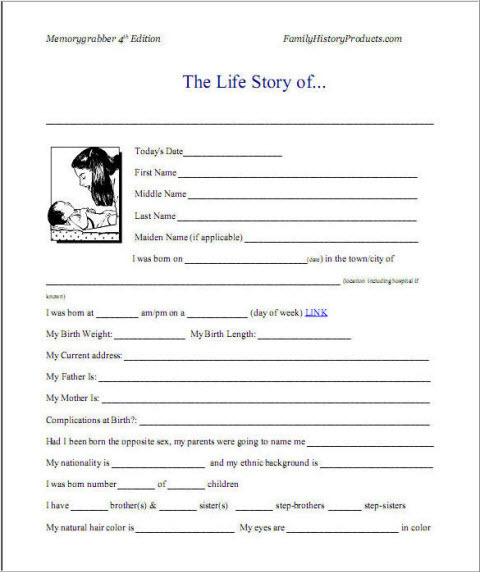 Here is a sample autobiography worksheet. Just download, print and fill it out. You will find more worksheets like this further down this page. I found such a lifestory workbook (autobiographical template) as a teenager and this way of writing an autobiography has fascinated me ever since. After all, who couldn't simply answer questions about their life? Yes, it is true. Even with a fill-in autobiography, one will have to write some. It's unavoidable, but this format gives the self-conscious writer some cover. Also, to be clear, the better that one can write, the better the finished "product" will be....regardless of method. Your life is more than a one man (woman) show! The people around you, parents, siblings, grandparents, friends etc all play/have played a role in your life's story. It's my opinion that any worthwhile autobiography will also include details about these individuals that were so close to you. It will tell of your interactions with them and how they had influence on your life. Questions and prompts dealing with others that have had influence in your life will also spark additional memories that can be included in your autobiography ... lifestory etc. Where in the birth order were you born? This may or may not be actually included in your actual autobiography, but it is a great exercise to help you recall a sample of stories from your life that you'll want to include in your autobiography. Timelines are magical! A timeline is a great way to outline the events of your life in preparation for writing your autobiography. Use this sample autobiography timeline chart to start outlining your life. It will get the memories flowing! 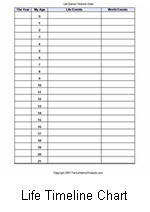 Print the chart out and begin by writing in the year your were born and each year after that. 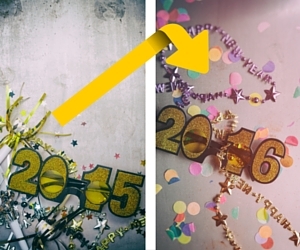 Then start added major milestones in your life on the line next to the appropriate year. These are very impressionable years. They are also a part of your life that your posterity will want to know about...because it is easier for them to relate to - as opposed to your current age and status in life. What's a walk-through memory anyway? Start by doing a childhood home walk-through with this free worksheet. Here are some additional examples of autobiography topics/sections. Some have portions of worksheets that I've developed. Feel free to download them (PDF format) and use them. Use any PDF reader to open these worksheets, such as Adobe Reader. 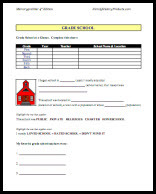 Print the worksheets and fill them out. Making lists of all kinds, to help you recall certain events from your life, is one of the most beneficial and FUN activities you will do. I've developed a lot of these lists to create. You'll like these! A list, or life list as I like to call them, is meant to spark memories. If you were to list every vehicle that you've ever own, it wouldn't necessarily be the actual list that is important to your posterity. But the memories associated with each of those vehicles (cars) might be. Memories are often attached to things...cars, in this example. After considering these, what stories come to mind? The stories remembered is the main purpose of the above exercise. The sample autobiography that I give on this web page, focuses on recollecting, organizing and then preserving events from your life for the purpose of passing personal history and stories onto your children, grandchildren etc. Other sample autobiographies might be more formal in nature such as those for a school project, but I believe the information included here will also help in this area as well...you be the judge. Regardless of the type of autobiography you are planning to write, I congratulate you on taking on such a rigorous and enjoyable undertaking. If you'd like more worksheets, like those I've included on this page, you will probably really enjoy my full 321 page autobiography template called Memorygrabber. I guarantee that it will help you recall many pleasant memories from your past. Perhaps many that you would never have, otherwise, thought to record in your autobiography. Special Note: If you found the information on this page helpful, please use any or all of the social bookmarking links below to let others know about the free worksheets on this page. Thank you!